In an earlier post, I reported on a talk I gave earlier this year at the PSA annual conference in Glasgow on the difference changes in social space in Parliament can make. On Friday, I gave a paper at the PSA Parliaments Group conference held at the Scottish Parliament on the significance, for legislatures and for members, of the use of social space. Formal space constitutes space used for scheduled meetings, with procedures and rules – enforced by a presiding office or chair – and usually with a record kept of proceedings. Social space is where none of these criteria apply and members meet informally. 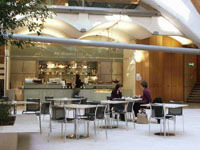 What happens in the tea and smoking rooms, and the dining rooms and bars, of the House of Commons has been neglected by political scientists, largely because it is largely unseen and not obviously quantifiable behaviour (unlike what goes on in formal space), but it can have significant consequences. The use of social space is important, for the institution, for institutionalisation and, for members, for socialisation, information exchange, lobbying, and mobilising political support. These matter. Institutionalisation and socialisation underpin the stability of the legislature. Information exchange and lobbying can impact on the actions of ministers and the outcomes of public policy. Mobilising political support can affect who holds, or does not hold, political office. These are not unimportant consequences. Take the last of these. Politicians who fail to utilise social space to mobilise support may be vulnerable. The failure to spend time mixing with his backbenchers contributed to Edward Heath’s loss of the Conservative Party leadership. Similarly with Margaret Thatcher. In the 1990 leadership contest, Michael Heseltine invaded the social space of the Commons whereas Thatcher neglected it. Had she spent time in the tea and dining rooms, garnering support among waverers, she may have got the votes necessary to be declared re-elected. She was only four votes short. The paper draws out the significance of using social space. There is more to explore, not only in comparative terms, but also in terms of how such space changes over time (the focus of my earlier talk) and how it is complemented now in virtual terms, with the use of social media, not least WhatsApp groups. What is remarkable is the extent to which it has been neglected by scholars. This entry was posted in Uncategorized and tagged Edward Heath, legislatures, Margaret Thatcher, Michael Heseltine, PSA, PSA Parliaments Group, social space. Bookmark the permalink. As what would once would have been termed a social smoker, I am not surprised.